Having survived diabetes, a lower leg amputation, a hernia, kidney transplant and eight years in the National Football League, this is merely a trifle on Ron Springs’ medical odyssey. Simple surgery to remove a quarter-sized, sebaceous, benign cyst from his left forearm? Just another mundane errand on life’s to-do list. And with that, at approximately 4 p.m., Springs is wheeled into a Medical City of Dallas’ Building A, third-floor operating suite. Springs waits patiently in room No. 14 until he is greeted around 4:15 by plastic surgeon Dr. David Godat. As Godat leaves for a short break in his office before the scheduled 5 p.m. procedure, Springs contemplates his pickle. He’s not exactly nervous, but pensive. Anxious, even. The problem area is more of a chronic, necrotic wound – a by-product of diabetes – that’s been bugging him for months. About an inch deep, it resides near Springs’ elbow, constantly irritating and itching and sometimes secreting a thick, yellow, fungal discharge. It’s as pesky as it is gross, but it’s about to be scraped to smithereens. Springs, whose hands and arms have curled into almost useless claws as a result of diabetes, seeks relief from a contractures specialist, but Dallas’ Dr. Bo Frederick refuses to perform the surgery until the potentially infectious spot is permanently removed. Eight days ago Springs consulted Medical City wound care specialist Dr. Laurie Aten, who referred him to Dr. Godat. The cyst was almost debrided twice in the last week (once in Dr. Aten’s office and once in Dr. Godat’s), but on both occasions Springs was unable to tolerate the pain despite Dr. Godat administering a local anesthesia to the arm. Surgery is the last resort. At 4:20 Dr. Joyce Abraham of the Texas Anesthesia Group arrives. She called Springs’ Plano home last night, but since the couple was out to dinner at Luby’s she merely left a message about today’s proceedings. She elects general anesthesia and prepares to induce Springs via LMA (Laryngeal Mask Anesthesia). Easing Springs’ mind is the fact that Dr. Abraham and Dr. Godat have worked together in concert approximately 25 times over the last three-plus weeks. His transplant and amputation surgeries were performed without hiccup at Medical City. 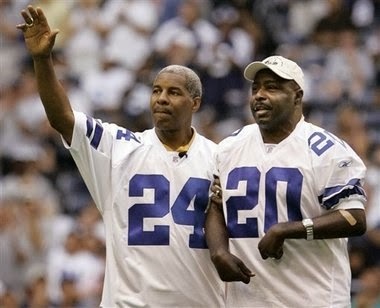 And besides, he is one of the hospital’s poster boys – a former Dallas Cowboys’ hero and a nationally lauded recipient of the first kidney to change bodies from professional teammates, donated by former Cowboy and close friend Everson Walls.